Following a vegetarian diet while in the military can be an especially challenging practice, but the information in this article can help you can stay healthy while doing so. Vegetarians eat a plant-based diet that excludes meat, poultry, and fish. A well-planned vegetarian diet can meet all your nutritional needs, but you have to take special care to ensure you don’t fall short on a few key nutrients such as protein, vitamins, and minerals. People choose to follow a vegetarian diet for a variety of reasons including health benefits, environmental concerns, and religious or personal convictions. Although vegetarians generally don’t eat meat, poultry, and fish, vegetarian practices vary. Semi-vegetarians do eat small amounts of poultry or fish. Lacto-ovo-vegetarians eat eggs and dairy products; lacto-vegetarians don’t eat eggs. Vegans (“VEE-guns”) do not eat any animal products. There are many health benefits associated with vegetarianism. Most notably, vegetarians tend to eat fewer calories than non-vegetarians, especially calories from saturated fat and cholesterol. Vegetarians also eat more whole grains, fruits, vegetables, and soy products than non-vegetarians do. As a result, they tend to weigh less and take in more of the foods that can contribute to reduced risk of many diseases such as cancer, diabetes, and heart disease. According to the Academy of Nutrition and Dietetics, a well-planned vegetarian diet can meet all of a person’s nutritional needs. Of course, it’s possible to follow a plant-based diet that is very unhealthy if you make poor dietary choices. Below is a list of the key nutrients that are sometimes found missing in a vegetarian diet, plus suggestions to help you get enough of them. Proteins are made up of amino acids—the body’s “building blocks.” They are needed for repair and maintenance of bodily structures, hormones, and immune function. There are 21 amino acids; 9 of them can only be obtained in the diet so they are referred to as “essential.” Vegetarians can easily meet their protein needs if they eat enough to meet their daily caloric needs. It’s important to eat a variety of non-animal proteins—grains, legumes, seeds, and nuts—throughout the day because many plant proteins don’t contain all the essential amino acids. Soy products and quinoa (a grain-like seed) are excellent sources of protein. Lacto- and lacto-ovovegetarians can obtain adequate protein from eggs or dairy products. Calcium is a mineral needed for strong bones and teeth, blood clotting, and nerve and muscle function. Although vegetarians who eat dairy products are rarely calcium deficient, vegans should take calcium supplements to ensure they get enough of this important nutrient. Plant sources of calcium include kale, collards, broccoli, bok choy, and fortified soy products, but it’s difficult to get enough calcium from these foods. In addition to helping the body absorb calcium, vitamin D plays many other important roles in the body. Vitamin D can be obtained through sun exposure, but concerns about skin cancer keep many people indoors or covered, reducing their exposure to sunlight, so it must be obtained from the diet. The best dietary sources of vitamin D are fatty fish (such as salmon), dairy products, and eggs. Vegan options include foods such as orange juice and soy products that have been fortified. Vegetarians should have their vitamin D levels monitored by a doctor and take a supplement if found deficient. Iron is a mineral that carries oxygen in the blood. It can be obtained from both animal and plant sources, but the body absorbs the iron from animal sources more readily. Eating vitamin C–rich foods such as citrus fruits or tomatoes during the same meal as an iron-rich food enhances iron absorption. Good sources of iron include dried beans and fruits, spinach, and brewer’s yeast. Vegetarian athletes, especially women, are at risk of developing iron-deficiency anemia and should have regular blood tests to monitor their iron status. Zinc is a mineral that helps the body fight off illness by maintaining immune function. Adequate zinc can usually be obtained from foods. Dietary zinc is rarely harmful, but special caution should be taken with supplements: Too much zinc can lead to copper deficiency. Zinc can be found in grains, nuts, and legumes such as beans or peas. Like iron, zinc is more readily absorbed from animal sources. Iodine is a mineral used by the body to make thyroid hormone. It is found in iodized salt, seaweed, and dairy products. Vegans who don’t eat iodized salt or sea vegetables are at risk of developing iodine deficiency; they should have their iodine status monitored by a doctor to determine if a supplement is needed. Vitamin B12 is needed for normal nerve function and formation of red blood cells. The best sources of B12 are animal products, but vegans can obtain it from fortified cereals or soy products. Vegans who don’t eat fortified foods should be monitored for deficiency. Taking too much B12 can mask other deficiencies, so be sure to take it under a doctor’s supervision. 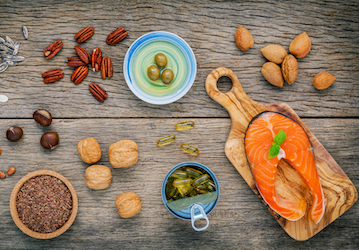 Omega 3 fatty acids play key roles in reducing inflammation and maintaining proper brain function, so it’s important to get enough of these nutrients in your diet. Plant sources of omega 3s include walnuts, flaxseed, and vegetable oils. You can read HPRC's “Omega-3 fatty acids in food” for more information. As with any dietary practice, vegetarian diets need to be well planned to ensure that meals are healthy and nutritionally adequate. Military personnel who choose to follow a vegetarian diet should take care to obtain sufficient protein, vitamins, and minerals. DoD also supports vegetarian lifestyles by offering vegetarian choices at dining facilities and in MREs. Mann, J., & Trusswell, A. S. (2007). Essentials of Human Nutrition. Oxford, UK: Oxford University Press.